Tsimshian (spelled Zimshian in the text presented here) is a language spoken today by about 800 people in British Columbia, centered around Prince Rupert, and in southeastern Alaska. It is closely related to Nisga'a and Gitxsan. Anglicans where Tsimshian is spoken worship in the Diocese of Caledonia and the Diocese of Alaska. The decision of many of the Tsimshian people to accept Anglican Christianity made them a frequent subject of missionary writings in the mid-nineteenth century British religious press. Tsimshian Christianity experienced a wide-reaching schism following disagreements between lay missionary William Duncan (1832-1918), who had been assigned to the major Tsimshian mission station at Metlakatla, and missionary bishop William Ridley (1836-1911). In the wake of heated public religious controversy between Duncan and Ridley, Duncan’s followers left British Columbia with him in 1887. They founded the colony of New Metlakatla in the relatively new American territory of Alaska. The Tsimshian community remains geographically separated by this schism today. This version of portions of the 1662 Book of Common Prayer was translated by William Ridley and Jane Holmes Ridley and published by the SPCK in 1882. Bishop Ridley's contemporary account of missionary life in British Columbia was published in 1904 as Snapshots from the North Pacific. Griffiths call this language Zimshian in his Bibliography of the Book of Common Prayer, and lists this text as Griffiths 198:1. A later printing is available from the Interent Archive as PDF graphice. Muss-Arnolt also discusses this and one subsequent, much longer, translation in Chapter LXXXIII. This later translation (Griffiths 198:2) is available from the Internet Archive. 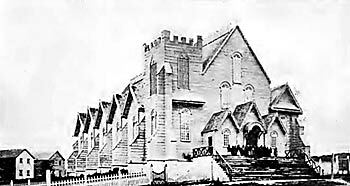 St. Paul's Church, Metlakatla. Built in 1874 and said to be the largest church west of Chicago and north of San Francisco at that time. It burned down under questionable circumstances in 1901.